The Jumbo Connect 4 is the life-sized version of the classic Connect 4 game. It's always an instant hit with all ages! This jumbo version is 4 feet wide and 4 feet tall! Connect 4 is now more fun than ever. 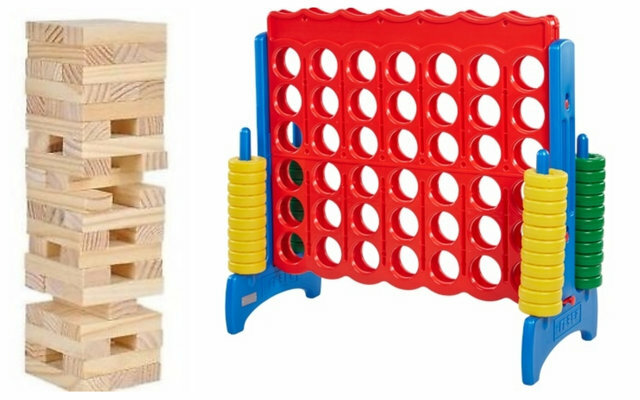 The Jumbo Jenga is a larger version of the classic Jenga game. Keep stacking and the tower will keep growing, until it eventually tumbles down. This jumbo version starts at a little under 3 feet and can reach as high as 5 feet - if you are that good! Recommended age is 3 years and up.